Ven. 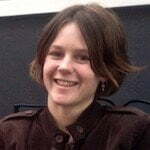 Thubten Lamsel began studying the Dharma in 2011 at The Dhargyey Buddhist Centre in Dunedin, New Zealand. 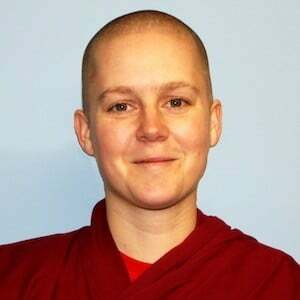 When she began exploring the possibility of ordination in 2014, a friend referred her to the Preparing for Ordination booklet by Venerable Thubten Chodron. Soon after, Ven. Lamsel made contact with the Abbey, tuning in weekly for the livestreamed teachings and offering service from afar. In 2016 she visited for the month-long Winter Retreat. Feeling like she had found the supportive monastic environment she had been looking for, under the close guidance of her spiritual mentor, she requested to come back for training. Returning in January 2017, Ven. Lamsel took anagarika precepts on March 31st. 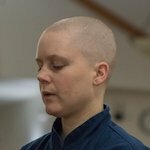 In the most fantastic circumstances, she was able to take her sramaneri and shikshamana vows during the Living Vinaya in the West course on February 4, 2018. See photos. Ven. Lamsel previously worked as a university-based public health researcher and health promoter at a small non-governmental organization. At the Abbey she is part of the video recording/editing team, helps with inmate outreach, and enjoys making creations in the kitchen.